Minnesota Governor Mark Dayton visited the site of a truck/train crash and derailment over the weekend in Callaway MN, and he praised the town and first responders for their quick actions to prevent major injuries. He also used that accident to illustrate the need to upgrade railroad crossings around the state. More than 200 residents of the town were forced to evacuate after there was a crash between a train and a big rig carrying 10,000 gallons of propane. Two members of the crew had minor injuries, but one one was seriously injured. The train and truck crash, which led to an explosion of propane hours later after the evacuation, shows that it is very important for the state legislature to boost safety at railroad crossings in Minnesota, Dayton said. The governor said that he favors adding lights and bells to hundreds of railroad crossings. Dayton noted that there are 800 or more at-grade crossings in the state and they need to be upgraded in the next few years to prevent deadly accidents. Dayton complimented all first responders, local leaders and the local fire departments who put of the propane fire quickly. 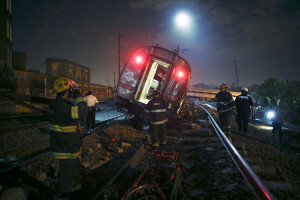 Our railroad and truck injury attorneys are glad that there were no serious injuries in this accident. However, railroad crossing accidents can be deadly and happen far too often. Thousands of people are hurt or killed annually due to these railroad crossing crashes. In many cases, the railroad crossing may lack necessary gates and flashing lights, or vegetation can be overgrown which can obscure the driver’s vision. In cases where the railroad crossing is not properly maintained, substantial settlements are possible where people have been injured in a train/vehicle collision. Major safety improvements are being made to a Wexford County, MI railroad crossing where a woman was killed a year ago. The woman, Kathryn Paddock, was killed at the deadly railroad crossing in Manton MI last March when her SUV was hit by a train. Since 1987, the Federal Railroad Administration reports that there have been five crashes at this crossing, with two deaths. While the current railroad crossing has yield signs, the Michigan Department of Transportation thinks more is needed. A team from MDOT evaluated the crossing and decided that lights and gates should be used to make the crossing safer. If there is more than one crash in a five year period in Michigan, the crossing must be automatically reviewed to decide if safety improvements need to be made. All of our Virginia railroad crossing accident attorneys send our condolences to this grieving family. It is unfortunate that so many railroad crossing accidents continue to happen in America every year. 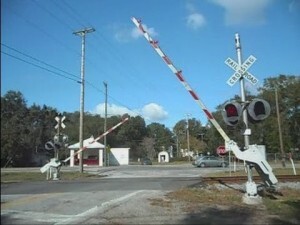 Many railroad crossings across the country only have railroad crossing signs and no lights or gates. The best warning devices for railroad crossings are ‘active warning devices’ that have lights that are electronically activated when a train approaches, as well as gates that lower automatically. Any time our law firm works on a railroad crossing accident case, we work with retired railroad workers and investigators to see if everything was done to ensure that the crossing was safe at the time of the accident. In some cases, the crossing may not have been properly maintained and this could be a factor in a crash. We have been involved in successful large settlements on railroad crossing accidents where the railroad did not do all it could to keep the crossing safe. We hope that all railroads will do their best to make sure that every railroad crossing they use is as safe as possible. The switch conductor for a railroad tank car in New Orleans has filed a personal injury lawsuit alleged that the railroad is liable for injuries he suffered on the job. The railroad worker states that he was employed by SGS Petroleum Services Corp, and on Aug. 23, 2015, while he was performing duties on a railroad tank car, he fell when the car shook due to poor track condition. The man fell several feet to the ground and had injuries to his lower back, left side ribs, left shoulder and right foot. The right foot injury required the amputation of his right small toe. He is suing for his medical expenses, economic loss, loss of enjoyment of life, and loss of earning capacity. Our FELA lawyers in Virginia hope that this man is able to prevail in this railroad injury lawsuit. According to the 72 American Jurisprudence Trials treatise on railroad health and safety that one of our lawyers co-wrote, negligence by railroads is quite common and can lead to worker injuries. Also, our FELA attorneys worked on a case where the railroad worker was permanently disabled due to track irregularities, leading to a $900,000 settlement. Five cars on an Amtrak train in Cimarron, Kansas derailed early yesterday morning, sending 29 people to the hospital with non-life threatening injuries. According to Amtrak, the train was traveling from Los Angeles to Chicago when it derailed at approximately midnight on Feb. 12. According to the Kansas Highway Patrol, five cars derailed and were on their side. Although the cause of the accident is not clear at this point, one of the passengers told the NTSB that she felt the train shaking just before some of the cars derailed. 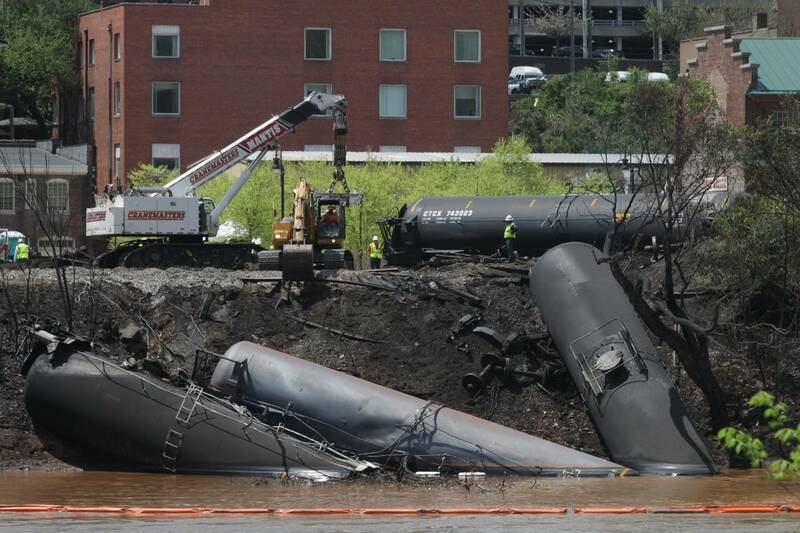 The NTSB has sent a team to the area to investigate the derailment. We expect that more information will be released about this derailment in the coming days. Our train accident personal injury attorneys have worked on many passenger injury cases in the past, and we hope that all injured Amtrak passengers in this derailment recover quickly. One of our attorneys, Richard Shapiro, was the author of 72 American Jurisprudence Trial Treatise, which is found in most US law libraries. It has a great deal to say about railroad and employee safety, which also is relevant in derailment cases such as this one. We are sure that the NTSB will be taking a very close look at the condition of the railroad track in the area of the derailment. Our train derailment attorneys in Virginia have seen major railroads outsource track maintenance in the past, which can lead to safety problems. For example, CSX has tried to save money by leasing less used railroad tracks to smaller, short line railroads. This means that CSX does not have to maintain the track anymore. This means that CSX can then blame the small railroad for any mishaps that occur. In cases where the railroad was negligent, we have had success in securing sizable settlements. The Federal Railroad Administration (FRA) last month launched a new web request page for train bridge safety inquiries. Now state and local officials can request information about the safety of railroad bridges in their communities. Once the request has been filed with the FRA, the railroad has 30 days to provide a safety report. According to FRA Administrator Sarah Feinberg, the FRA has urged railroads in the past to be more transparent and responsive to state and local leaders that are concerned about the condition of railroad bridges in their communities. She noted that providing these safety reports on local bridges is an excellent first step but more needs to be done. The FRA also has requested more funding to double its bridge specialist staff and to create a rail bridge inventory throughout the US. The Fixing America’s Surface Transportation Act signed by President Obama last year mandates that railroads provide safety information about railroad bridges to state and local officials on a regular basis. Our railroad accident attorneys in Virginia and North Carolina are familiar with how railroads will cut corners on safety to increase profit margins. Sometimes they will do this by leasing part of their railroad line to a short line railroad. This means they no longer have to spend money on maintaining that section of track. So, the railroad can save maintenance costs and blame the small railroad company for any accidents that occur. Or, the railroad will fail to properly inspect and maintain railroad bridges to save money. That is why we support the FRA’s recent action to make it easier to obtain safety reports about railroad bridges. There are times when railroads will neglect public and worker safety and it leads to serious accidents We once handled a case where a railroad bridge worker had his lower leg crushed by 1600 pound bridge timber. The railroad eventually accepted that it was at fault, but it would not offer a settlement higher than $400,000 during mediation. So, our Virginia railroad accident lawyers went to trial and eventually the young man won a verdict of $1.5 million. Metro-North, a major commuter railroad line in the New York City metro region, reported this week that both customer and employee injuries increased in 2015. Statistics show that total employee injuries are up by 9.5% from 2014. Meanwhile, Federal Railroad Administration (FRA) reportable injuries have increased by 1.7%. However, injuries for customers on Metro-North increased in 2015 by 30%. Metro-North officials said that the increase of accidents is partially caused by expanded incident reporting requirements. This was ordered by local officials after more accidents in 2013. The statistics stated that there were 360 customer injuries on the line in 2015, which is the second most ever in a five year period. More than half of that increase was due to a major train crash in Valhalia NY, which killed six and injured 46. FRA asked Metro-North two years ago to expand what it considers a reportable injury to customers. In the past, injury reports were anything that occurred on the train or platform. Now, customer injury statistics reflect any injuries that occur inside a terminal. Regarding employee injuries, while the FRA reportable injuries were up only 1.7%, total employee injuries were up by over 9%. The rail line believes that could be attributed to its implementation of the Confidential Close Call Reporting System, which allows employees to report safety issues privately. As the treatise also notes, injuries are not usually FRA reportable unless the injuries require medical attention or prescription medication. As we have seen in some of our railroad worker injury cases, serious injuries can occur when the railroad neglects safety, such as this $825,000 settlement where the railroad worker suffered a serious injury due to a loose ladder on a train car. Almost 10 years after a CSX railroad conductor died in a remote part of Florida as he worked for the railroad, the Florida Supreme Court has agreed to take up a lawsuit about CSX Transportation’s duty to provide medical assistance. The widow of the deceased train worker, Larry Sells, appealed to the FL Supreme Court after the First District Court of Appeal ruled for CSX in the medical negligence case. Sells died from a heart attack in August 2006 after he went to manually operate a track switch in a remote part of Clay County FL. A co-worker found him within two minutes and called CSX for help, but the dispatcher could not clearly communicate where the stricken man was, and the EMTs did not arrive for 35 minutes. The lawsuit alleges that CSX did not provide a safe workplace, which should have included a lack of automated external defibrillators. The First District Court of Appeals sided with CSX last May, stating that while CSX did have to provide prompt medical treatment once it knew the man was ill, it did not have a duty to take measures in advance to prevent such an emergency situation. However, the widow’s attorneys argued that CSX breached its duties under the Federal Employers Liability Act (FELA) and that the appeal court ruling could have serious repercussions throughout the US. The brief filed by the plaintiff’s attorney stated that the appeals court decision could be used by FELA employers in state and federal courts to support their failure to take preemptive measures to ensure their workers get quick medical care in an emergency. Two people suffered non-life threatening injuries in Nashua, Iowa on March 2 when a train hit a tractor trailer at a train crossing. Nashua IA police stated that after the crash, the truck driver and train conductor were taken to the hospital with minor injuries. Police stated that they thought that the truck driver did not see the train as he was approaching the train crossing. All too many railroad crossing accidents occur in the US each year. Many people assume that if a car is struck by a train at a railroad crossing, the car driver is nearly always at fault. This is not the case. Most people are unaware that railroads are required to keep railroad crossings properly maintained. They must ensure that the railroad crossing gates and flashing lights operate properly. They also must make certain that vegetation has not overgrown around the crossing so that it obstructs the view of the driver. Our railroad crossing accident law firm has represented several clients who were injured at railroad crossings. One case involved a Norfolk Southern train that slammed into our clients’ car in Prince William County, Virginia. The two children in the rear seat were injured. The father stated that he could not see the train until the last second, so we reviewed the trees, brush and vegetation at the railroad crossing. We examined Virginia common law and demanded a settlement from the father’s insurance company, and also from Norfolk Southern Railroad. The Federal Railroad Administration (FRA) is inviting comments about its controversial train horn rules that are 11 years old. Current rules mandate that locomotives blast their horn when approaching a railroad crossing for safety purposes. Several members of Congress from Colorado, including several representatives in the House and both US senators, applauded the FRA’s move and urged residents of the state as well as local government officials to provide comments to the railroad agency. Many politicians say that train horn noise is a serious issue for communities across Colorado and many other states. They say that they are advocating for flexibility in train horn rules to help some communities create more quiet zones that can increase economic development. Current FRA rules that were set up 2005 allow communities to apply for permission from the federal government to create a quiet zone where the train horn rules can be relaxed IF the community puts up flashing lights and barrier gates. Local government officials complain that it is too expensive for them to satisfy FRA’s requirement to set up quiet zones in this way. Current rules state that train engineers must sound their horn for at least 15 seconds in advance of reaching a train crossing. Our railroad accident attorneys in Virginia understand the concerns that some residents have regarding train horn noise. The problem is that safety gates are not a 100% solution. We have seen many train/car accidents over the years where the safety gates malfunction and stay up as the train is approaching. We also have seen railroad crossings in some cases that were not properly maintained, with too much vegetation obstructing the view of the driver at the crossing. Our railroad accident lawyers have handled cases with sizable settlements where serious accidents have occurred at railroad crossings. So, it is important for concerns over train horn noise to be considered in light of the fact that train horns sounding at crossings save lives. Also, we think that the outcry over train horn noise only reinforces that positive train control systems must be implemented sooner rather than later, but the Federal Railroad Administration keeps allowing railroads to lobby for delays on implementation of PTC systems for the nation’s railroads. These are the systems that automatically can slow and stop a train if it detects a vehicle on a railroad crossing, or that the train crossing lights and gates are activated. Norfolk Southern Railway Company has filed a motion to dismiss a lawsuit against it, alleging that a former employee has falsified a workplace injury. The former railroad worker filed his workplace injury lawsuit in September 2015, but Norfolk states that the federal court in which it was filed lacks subject matter jurisdiction. The man claims that he was working for Norfolk in March 2012 when he tried to release a hand brake and hurt his back, which was diagnosed as a severe lumbar sprain. When he asked for an injury document from the railroad because he was immobile, the company would not do so. He also claims that Norfolk obtained unauthorized medical records from his hospital while he was undergoing treatment. The company then accused him of falsifying a work injury through letters and also requested a hearing for not promptly reporting the injury. The complaint also alleges that the worker was not paid for his 2010 time slips, and after he had recovered from an eye injury, he was not allowed to go back to work by the company’s doctor. Our FELA attorneys in Virginia Beach have represented many former railroad workers who suffered injuries on the job. While we cannot comment on whether or not the man in the case above falsified his injury, we do know that railroads will try their utmost to deny rightful claims for injured workers. We represented a railroad worker who was injured in April 2003 when he was walking along a railroad track checking air brakes on a train. His foot suddenly fell into a depression in the ballast rock. This caused a serious lower back injury. He was subsequently totally disabled from his work at 37 years old. Our law firm in Virginia determined what had caused the sudden depression in the ballast rock by retaining a hydro-geologist who examined the water flow in that region. We were able to prove that the track was constructed improperly which led to small voids and open gaps in the ballast rock. We settled that case for $900,000.